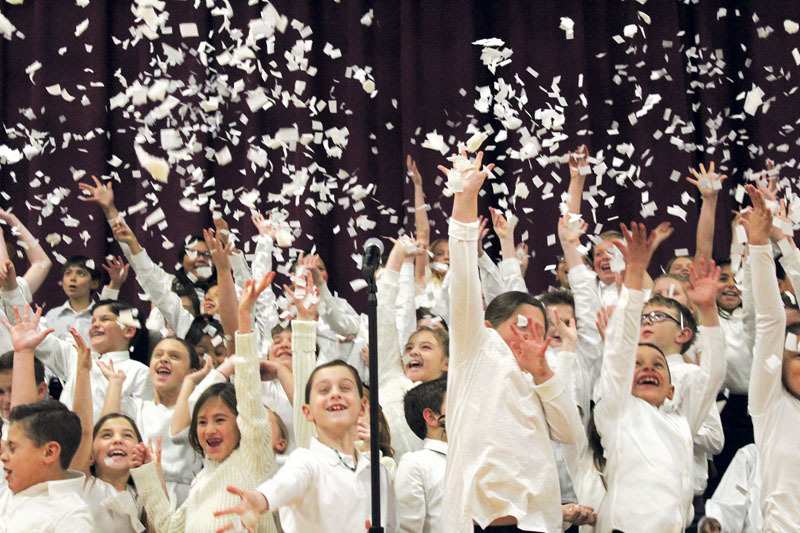 The Vernon School third- and fourth-grade choruses throw “snow” in the air during their concert finale. Student talent shined brightly in the Oyster Bay-East Norwich Central School District as a series of winter concerts took the stage throughout the month of December. 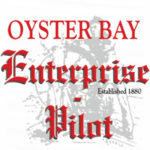 Audiences were put in the holiday spirit with chorus, band and wind ensemble performances at Oyster Bay High School; band and chorus presentations at James H. Vernon School and a music showcase featuring the district’s youngest students at Theodore Roosevelt Elementary School. 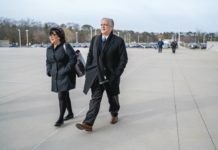 The series culminated on a generous note as the Friends of the Performing Arts Center (PAC) president Ravin Chetram presented the district’s fine and performing arts department with a $5,000 check to send 125 band members to Carnegie Hall, where they will perform on April 19. 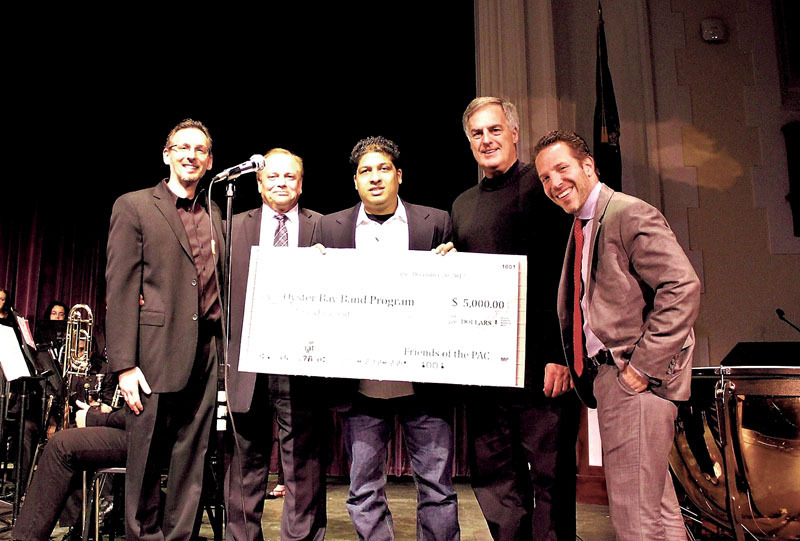 PAC, a nonprofit organization that was originally founded to refurbish the high school auditorium, supports a variety of music department initiatives, such as sponsoring the Chamber Singers Music in the Park performances, master classes at Vernon and Oyster Bay High School, a five-week afterschool theater class at Vernon, scholarships to seniors and food for late-night rehearsals of student performances. The Oyster Bay High School Symphonic Band gives a rousing performance. 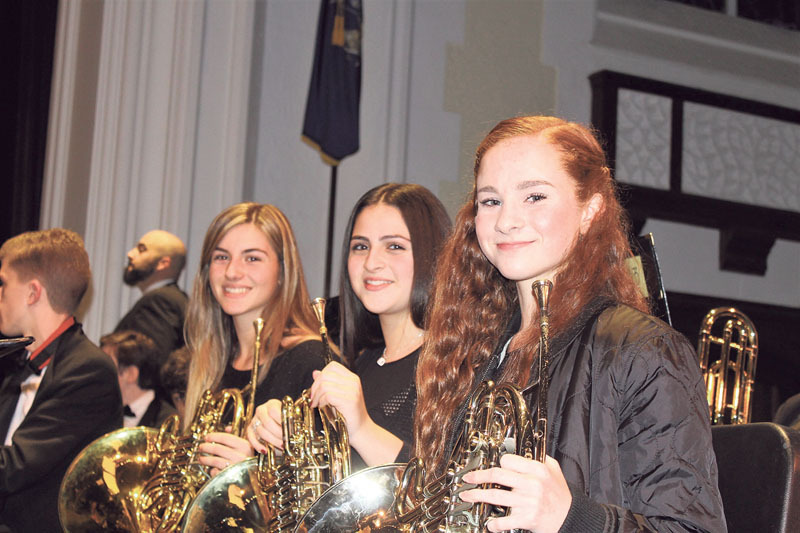 The concert series began with the seventh- and eighth-grade jazz band performing pieces by Duke Ellington and Van Morrison, and the seventh- and eighth-grade concert band playing pieces such as “Abracadabra” and “Good Night, Dear Heart” under the baton of music teacher Michael Giannetta. 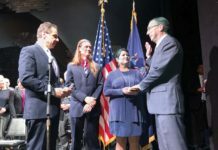 The evening also featured Oyster Bay High School’s Symphonic Band, conducted by music teacher Matthew Sisia, which, among its selections, played a series of American River songs. The next evening, Vernon School’s fifth- and sixth-grade students delighted family and friends with such performances as “Jingle Bell Jam” by the sixth grade jazz band and “Sleigh Ride” by the intermediate band, both conducted by Joe Devassy. The advanced band, led by music teacher Lauren Macy, entertained the audience with four numbers, including “Ancient Voices” and “Frosty’s Caribbean Holiday.” The evening culminated with songs by the fifth- and sixth-grade chorus, under the direction of music teacher Louis G. Costidis and accompanied by Elinor Zayas. Among their musical selections was, “Waving Through a Window” from the Broadway hit Dear Evan Hansen. In a separate concert, the third- and fourth-grade choruses brought the holidays to life with songs performed with jingle bell necklaces, by candlelight and, for the finale, a fistful of “snow” thrown into the air. 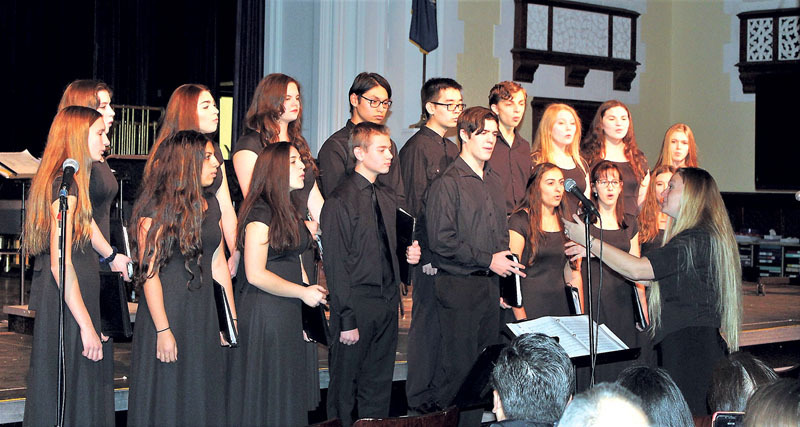 The Oyster Bay High School Chamber Singers delight the audience with their musical selections. In another concert, the Oyster Bay High School Wind Ensemble, conducted by Mathew Sisia, filled the auditorium with the rhythms of Mexico while the Chamber Singers, led by Meagan Finnerty, beautifully harmonized songs, such as “Three Pieces for Chanukah” and “Frozen Choral Suite” featured in the Disney movie, Frozen. At Roosevelt School, the kindergarten and first-grade classes sang a selection of holiday favorites, such as “Rudolph the Red Nosed Reindeer,” “Hanukkah, Hanukkah” and “Frosty the Snowman.” Each second-grade class performed a song that showcased what they learned on various percussion instruments. Then all the second-grade classes came together for a finale. 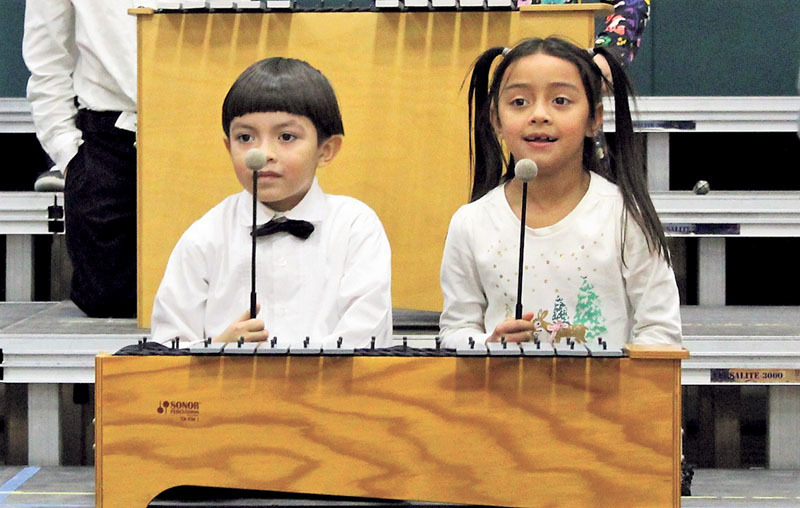 Theodore Roosevelt second-graders play percussion instruments during the school’s music showcase. 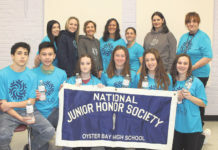 Prior to the concert, Michael Giarretto of Cruise Planners of Oyster Bay, who generously donated raffle prizes for the eighth- and 10th-grade college awareness tours, drew the raffle winners. First prize was a $750 Norwegian Cruise Line gift certificate, second prize was a $200 Cruise Planners gift certificate and third prize was a $150 gift certificate. Money raised from the raffles will help fund a four-day trip to various colleges as far as North Carolina for 10th-graders in January and a three-day trip to colleges in the metropolitan/ Philadelphia area for eighth-graders in April. Throughout the concert series, music teachers also took the time to recognize their students who were selected to perform in the Nassau Music Educators Association All-County Music Festival at Tilles Center for the Performing Arts in Greenvale, Jan. 12-14. Nearly 30 students in grades five to 12 were chosen for this special honor.